In today's Internet economy, companies need to operate efficiently and effectively. To eliminate the need for face-to-face transactions and inconvenience of administration, the information must be convenient to access anywhere, anytime and with anyone via the Net. Collaborating suppliers, business partners, customers and employees easily, the fast, flexible and scalability operations and platform are the baseline requirements for Internet business success. This document is an overview of Intisoft's Xentric - an XML server that delivers application, messaging, and connectivity support to collaborative e-business applications. Technology is changing from a cost of doing business to a way of doing business. Centralized markets for B2B commerce over the Internet will create unprecedented levels of market transparency and lower the cost of procurement. The distributed Internet marketplace allows suppliers to discover new buyers and new chance of doing business more easily, by tightly linking all partners together to improve process transparency and get the right products to the right place at right time. 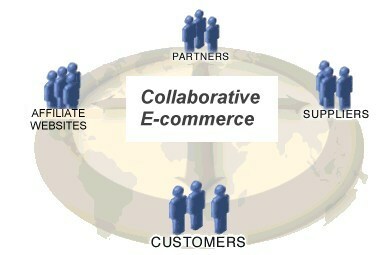 Collaborative e-business is new and powerful e-business trading and communications architecture. A business community of customers, suppliers and partners shares interests and do business with each other. Traditional business can resolve the inefficiencies and extend their business between their traditional agents, vendors, web business partners and their own consumers on the Internet. The new architecture can strike new revenue stream and give differentiation to business partners. Companies face many challenges when deploying new e-business services, however. The time required to create dynamic applications and the complexity of connecting to disparate information sources are common problems. Achieving strategic e-business goals has been difficult because the technologies available today for developing web-based applications frequently require that businesses rewrite applications and replace existing databases. Xentric is an XML server that delivers application, messaging, and connectivity support to collaborative e-business applications. As a dynamic, robust and scalable collaborative e-business platform, Xentric allows organizations to develop and deploy XML projects rapidly with minimal effort. Intisoft's Xentric was specifically designed to enable collaborative e-business featuring an extensible, open standards XML-based architecture to integrate with front and back-end applications as well as external information sources easily. Xentric features application server functions that support data flow between other servers and provide specific functionality including session management, and load balancing; and messaging server allows users to send and receive email and XML messages with partners, suppliers, customers and colleagues to form a dynamic messaging-based community. Xentric adopts application bean approach (XBean) to deliver application logic to Xentric-based e-business systems. This allows enterprise and application service providers to customize user interfaces, extend application logic, integrate with other components and link seamlessly to existing information systems and data. Xentric supports XBeans written in C, Java and PHP. For presentation logic, developers can select a scripting language of their choice, such as JSP, Java Servlet, PHP, Cold Fusion and ASP.